Wheat procurement by government agencies during current Rabi marketing season has crossed the last year mark. It is 5 lakh MT more than last season’s procurement. 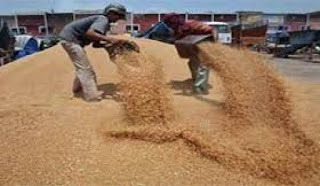 Till May 27th this season 267,06,313 MTwheat has been procured by the government agencies in various wheat growing states, while during last season it was 262,86,152 MT on the day. In order to give relief to the farmers affected with unseasonal rains and hailstorms, the Government had relaxed quality norms for wheat procurement and also decided to bear value cut , if any imposed for shrivelled, broken and luster lost grains, so that farmers get full Minimum Support Price(MSP) for their produce. Punjab has procured over 98.66 lakh tonnes of wheat this season, while neighbouring Haryana has surpassed its procurement target for the season by procuring 67.55 lakh tonnes. The Union Minister of State (Independent Charge) of the Ministry of Development of North-Eastern Region (DoNER), MoS PMO, Personnel, Public Grievances, Pensions, Atomic Energy and Space, Dr. Jitendra Singh announced Rs 325 crore worth projects for Northeast, out of which Rs 200 crore will be meant for projects in the State of Assam and Rs. 125 crore for "Organic Farming Mission" for the entire North-Eastern region. He was addressing a mammoth public rally organized in Guwahati today on the occasion of completion of one year of Narendra Modi government. Earlier, addressing a press conference soon after his meeting with Assam Chief Minister, Shri Tarun Gogoi, Dr. Jitendra Singh said, some of the projects got stuck up for certain reasons, but moving the Ministry on a fast track, these projects have been once again revived and the work will begin very soon. The main feature of the projects for the State of Assam, he said, would be that they are primarily based on the priority and the preference given by the State Government of Assam and therefore, the State will not have any reason to complain that it was not taken into confidence by the Union Government while deciding on the projects. This is also a part of Prime Minister, Shri Narendra Modi’s belief in “cooperative federalism”, which envisages involvement of the State Governments regardless of whichever be the ruling party there, he added. Dr. Jitendra Singh also disclosed that he had assured CM Shri Tarun Gogoi that the work on the multilevel car parking complex in the heart of Guwahati and construction of Assam Management Institute building will expedited by the DoNER Ministry. When asked about the nature of projects, Dr. Jitendra Singh said, mostly the DoNER projects for Assam as endorsed by the State Government are related to construction of widening of roads and upgradation or establishment of the water supply schemes. As far as organic farming is concerned, Dr. Jitendra Singh said, this is one of the ambitious projects undertaken by DoNER Ministry in the last few months and it will be a distinct feature of our “Make in Northeast” plan which is an expansion of Prime Minister, Shri Narendra Modi’s “Make in India” vision. He informed that a concept paper has been prepared on the subject which is in circulation among various Ministries in Government of India for their inputs and suggestions. Once this process is completed, the concept paper will then be brought before the Union Cabinet, he added. The various specific products to be taken up under organic farming will be determined by the requirement and feasibility, but most likely in the initial phase, the focus will be on fruits and large cardamom. Dr. Jitendra Singh also called on Assam Governor, Shri P.B. Acharya, who has a long experience study about North-Eastern region. The DoNER Ministry and Governor discussed various aspects relating to the current political situation in the State and the emerging social scenario in the region. Air Marshal Jagjeet Singh VSM, Air Officer Commanding-in-Chief (AOC-in-C), Maintenance Command, Indian Air Force arrived at Air Force Station Tughlakabad, a premier Base Repair Depot (BRD) under Maintenance Command, on 26 May 2015 on a two days visit. This was his first visit to BRD, after assuming Command as AOC-in-C, Maintenance Command. AOC-in C, MC was received by Air Commodore Yogesh Handa, Air Officer Commanding (AOC), Air Force Station Tughlakabad. On his arrival, an impressive Guard of Honour was presented to the AOC-in-C. The AOC-in-C visited various production wings, calibration facilities, logistics sites and other vital installations. While addressing the Depot personnel, he appreciated the involvement & enthusiasm of all the personnel in ensuring high serviceability of the equipment towards operational preparedness of the field units. He also emphasised on the need to focus on indigenisation efforts so as to achieve self-reliance, while ensuring reliability and quality of production. The Air Marshal also stressed upon the need to find solutions to techno-logistic challenges for sustaining operational preparedness of the IAF, in the coming decades. India and Germany held talks to expand the Defence Cooperation between the two countries, here yesterday. The talks were held between the delegation of the two countries led by their respective Defence Ministers. The Indian side was led by Shri Manohar Parrikar and the German side by Dr (Ms) Ursula von der Leyen. Cooperation between the Armed Forces of the two countries, partnering of Germany in the Make-in-India initiative in the defence sector and supply of state-of-the-art equipment/ technology were some of the prominent issues discussed by the two Defence Ministers. Both sides also exchanged their perceptions on the evolving geo-political events having impact on the security situation. The German Defence Minister’s visit to New Delhi is taking place close on the heels of the Prime Minister Shri Narendra Modi’s recent highly successful visit to Germany. The visit would also pave the way for the German Chancellor, Ms Angela Merkel’s visit to India later this year. Dr (Ms) Ursula von der Leyen will be visiting the Western Naval Command in Mumbai tomorrow, before concluding her 3 days official visit to India. Squadron Leader (Sqn Ldr) Ajay Ahuja of the Indian Air Force made the supreme sacrifice for the nation on 27 May 1999 during ‘OP Vijay’ while on a combat mission over Kashmir. The officer’s aircraft was hit by an enemy shoulder fired Surface to Air Missile (SAM) while he was attempting to locate a downed pilot in spite of being aware of the danger to his life owing to the existence of SAMs in the area. This extremely courageous act involving immense risk to this life epitomises the tenacity and indomitable spirit of the Indian Fighter Pilot. Tragically, Ajay paid the price for his bravery. His aircraft was hit and damaged severely. Though the Officer ejected safely, he was killed by the enemy in captivity. The Officer will always be remembered as a courageous and selfless soldier who laid down his life without a second thought for his country and for his brothers in uniform. Sqn Ldr Ajay Ahuja hailed from Kota in Rajasthan. He was an alumnus of the National Defence Academy and was commissioned in the IAF on 14 June 1985 as a fighter pilot. Over a span of fourteen years in various squadrons of the IAF, he served as an operational pilot on MiG-21 variants and on the MiG-23 Fighter bomber. He grew up in service to become top instructor with an experience of over 1000 hours spent in instructing ab-initio pilots. He was extremely popular among his pupils because of his patience and cheerful nature. A thorough professional, the Officer was the Flight Commander of the Golden Arrows. We salute this brave officer for his gallantry and draw inspiration from his dedication and bravery. His wife Mrs. Alka Ahuja and son Ankush survive him. The Minister of Health & Family Welfare Shri Jagat Prakash Nadda successfully steered the proceedings of the 68th Session of the World Health Assembly in his capacity as its President. It was after a gap of 19 years that India assumed the Presidency of the World Health Assembly, the highest decision making body of the World Health Organisation. The 68th WHA took place in Geneva from 18-26 May 2015. The significant outcome of the 68th World Health Assembly is the adoption of a Global Action Plan on Anti-Microbial Resistance (AMR) which prepares a blueprint with specific actions and timelines for WHO as well as Member States to address the growing threat of AMR. The UN General Assembly is expected to hold a high-level segment on AMR in 2016 to further highlight the need for comprehensive implementation of the Plan. Other major outcomes of the 68th World Health Assembly include bringing adverse health impacts of air pollution to the main agenda of the World Health Organization and extension of the implementation timeframe of the Global Strategy and Plan of Action on Public Health Innovation and Intellectual Property (GSPOA). The Assembly also endorsed the Director General’s Action Plan to strengthen the emergency response capacities of WHO and approved a 8% increase in WHO’s programme budget for 2016-17. India played a constructive role in the adoption of consensus resolutions on AMR and air pollution and also co-sponsored the resolution on GSPOA. India used the opportunity of its Presidency to reiterate its commitment to WHO and announced voluntary contributions to the tune of US $ 2.1 million towards the new WHO contingency fund, the pooled fund for implementation of R&D demonstration projects and the Member State Mechanism on SSFFC Medical Products. In his capacity as the President of the 68th World Health Assembly, Shri J P Nadda and Dr. Margaret Chan, Director-General of WHO jointly inaugurated a photo-exhibition on “Yoga for All, Yoga for Health” on 19 May, 2015. This is the first major event on Yoga at the United Nations since adoption by the UN General Assembly last year of a resolution that declared 21 June as the International Day of Yoga, and a precursor to the first observance of the International Day of Yoga on 21st June this year in Geneva. Shri J P Nadda led the Indian delegation at the Commonwealth Health Ministers’ Meeting, 8th NAM Health Ministers’ Meeting and BRICS Health Ministers’ Meeting held on the side line of the Assembly. He also had bilateral meetings with his counterparts from China, UK, USA, Sweden, The Netherlands, South Africa, Brazil, Timor-Leste and Turkmenistan. The following are the lists, in order of merit of 235 (136 +85+14) candidates who have qualified on the basis of the results of the Combined Defence Services Examination (II), 2014 conducted by the Union Public Service Commission in October, 2014 and SSB interviews held by the Services Selection Board of the Ministry of Defence for admission to the 139th Course of Indian Military Academy, Dehradun; Indian Naval Academy, Ezhimala, Kerala and Air Force Academy, Hyderabad (Pre-Flying) Training Course i.e. 198th F (P) Course. The number of vacancies, as intimated by the Government is 200 for Indian Military Academy [including 25 vacancies reserved for NCC ‘C’ certificates (Army Wing) holders], 45 for Naval Academy, Ezhimala, Kerala Executive(General Service) (including 06 vacancies reserved for NCC ‘C’ Certificate (Naval Wing) holders] and 32 for Air Force Academy, Hyderabad. The Commission had recommended 4570, 2837 and 531 as qualified in the written test for admission to the Indian Military Academy, Indian Naval Academy and Air Force Academy respectively. The number of candidates finally qualified are those after SSB testing conducted by Army Head Quarters. These results will also be available on the UPSC website at http://www.upsc.gov.in. However, marks of the candidates will be available on the website after completion of its complete process i.e. after declaration of final result of Officers’ Training Academy (OTA) for Combined Defence Services Examination (II), 2014.